Just as he was about to finish college, New Jersey-native Michael Fuehrer took a long road trip where he had a bit of a revelation — he needed to create a home for his “restless mind and wandering soul.” The result? 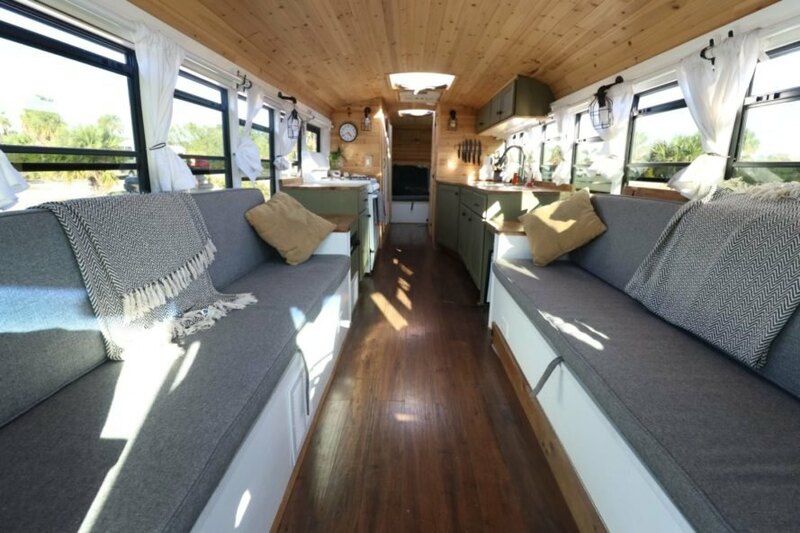 A beautifully renovated 2004 Thomas Freightliner that he converted into his dream home on wheels, complete with a rooftop sun deck. 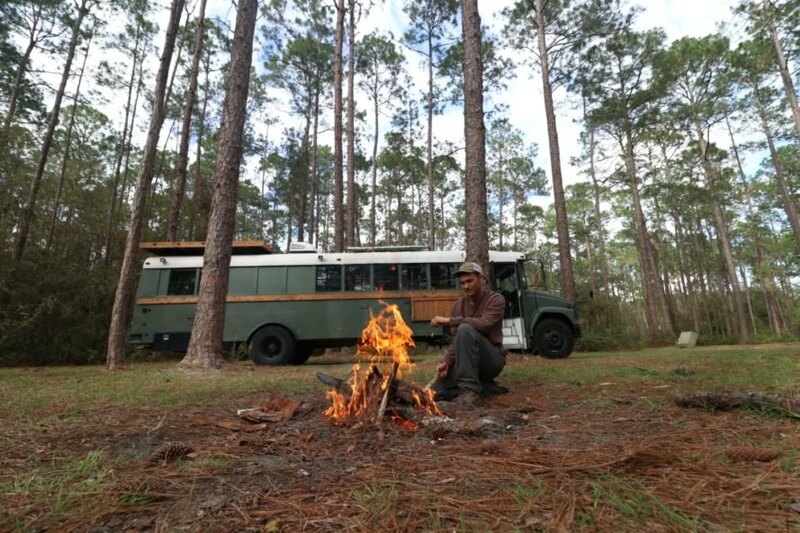 Today, Fuehrer enjoys living life off the grid, traveling whenever and wherever he wants in his solar-powered skoolie, lovingly called Navigation Nowhere. With a little help from his father and friends, it took Fuehrer about nine months to finish the bus conversion, which took place in his very patient parents’ driveway. On his blog, where he recounts the process, he said that the first step was the most grueling — gutting the run-down interior. He started with removing the seats by painstakingly grinding out every bolt that held them in place. The next steps were to remove the flooring, ceiling and side panels. Once the old, rusted interior was cleaned, the next step was to create a livable space out of the compact, 180-square-foot interior. To make maximum use out of the tiny space, Fuehrer decided to install various space-saving features and flexible, custom-made furnishings that serve multiple functions. For instance, two long couches, which were installed on either side of the open-plan living area, provide plenty of seating. When needed, they fold out to create one large bed that meets in the middle, or just one can be folded out into one small bed. Hidden underneath the couches is a large wooden table that can be set up for a dining area for up to eight people. Moving back from the living room, the kitchen is an impressive space that includes extra long counters, a kitchen sink, a full oven with stovetop and a refrigerator. At the far end of the bus is the master bedroom. Also set up to be a flexible space, this area has a sofa that folds out into a bed and two desks that simply click into place when the need to work arises. The ambitious design also features a tiled bathroom with a full shower and a composting toilet. Throughout the tiny home, there are ample windows and even three skylights (originally the emergency exits) that make the space more welcoming. 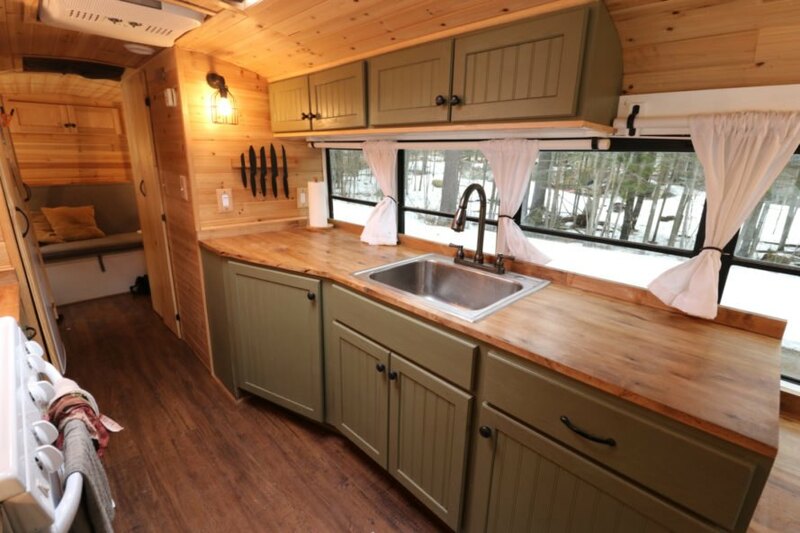 The exterior of the bus was painted a forest green, with a few wood panels added on to the sides. At first sight, the panels seem decorative, but they serve a dual purpose. A side table made out of reclaimed wood swings out to become an outdoor dining space. Walking out to the back of the bus, a ladder leads up to the rooftop deck, which shares space with the solar array. Solar panels, as well as propane tanks and a massive 130-gallon water tank, allow Fuehrer to live off the grid for long spans of time. I don't see any pics of the deck. Next time, if you mention it, please take a photo. 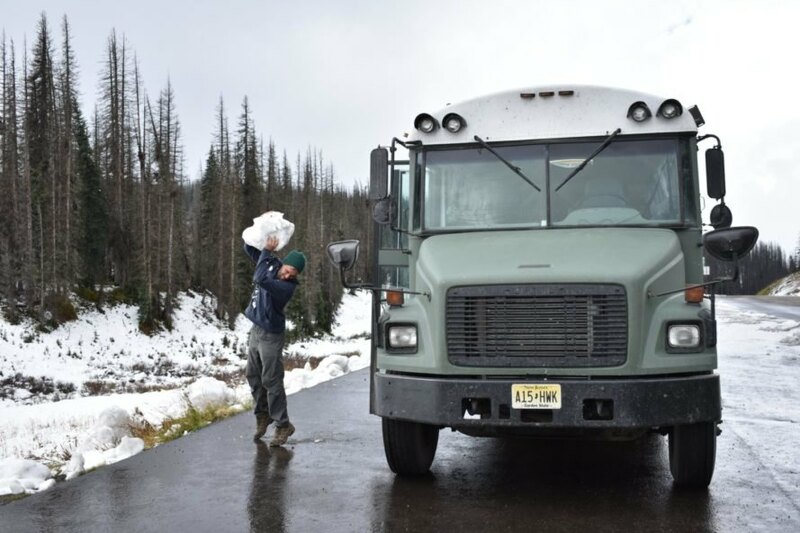 New Jersey-native Michael Fuehrer converted the 35-foot-long Thomas Freightliner into his dream tiny home. 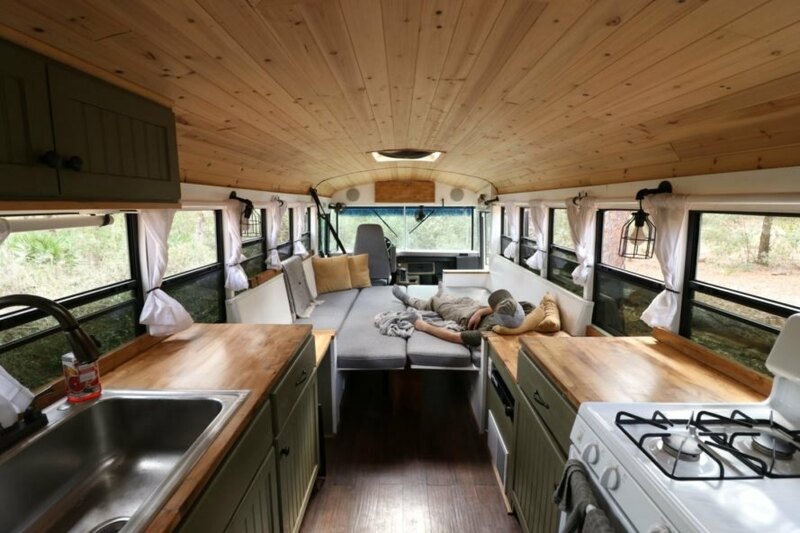 Today, Fuehrer enjoys off-grid life in his converted solar-powered skoolie. The interior space is just 180 square feet. The living room pulls double duty as a bedroom. The dual couches can fold out into one large bed. The kitchen was designed to provide plenty of space for cooking. Fuehrer has spent the last few years traveling the country in his bus.